One of Icing On The Ring's most sought-after styles, our micro-prong engagement rings are engineered to maximize sparkle. Each individual side diamond fits snugly in the tiny prongs along the ring's body so each stone visibly shines as brilliant and eternal as your love. Make your proposal a moment she’ll never forget when you choose a ring from this collection at Icing On The Ring. Our micro-pong diamond settings help provide extra sparkle for a truly jaw-dropping look. When you choose one of these diamond engagement rings, you’ll get an undeniably glamorous piece that will have everyone talking. 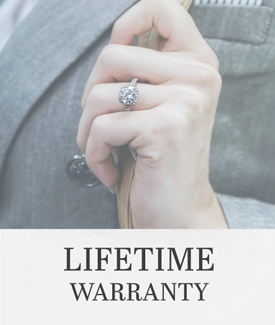 These are timeless rings she can wear for a lifetime to remember the amazing commitment you’ve made to one another. Shop at Icing On The Ring today to find the perfect diamond engagement ring for that special someone in your life. Our micro-prong engagement rings are the perfect choice for your sophisticated sweetheart. The luxurious appearance is ideal for any woman who recognizes the fine craftsmanship and attention to detail that goes into designing these lovely pieces. Each of the diamonds along the sides of the center stone sit snugly in the tiny prongs along the band. This creates an extraordinary amount of shine and sparkle to really call attention to the ring. Not sure which types of rings will appeal to her taste? With plenty of options at Icing On The Ring, it’s easy to find the perfect choice for the love of your life. You can choose from yellow gold, white gold, or even rose gold rings to get the color that complements her style. Go for a simple and sleek band or opt for something more opulent and ornate. Choose a vintage-inspired ring or pick out a modern design that matches the latest trends. Find all of these stylish options when you browse through our collection of micro-prong setting rings at Icing On The Ring.